An added bonus in the style stakes for winter is the opportunity to sport a good quality men’s scarf. Creating depth and interest to your overall look, a scarf is one of the easiest accessories for men to wear, affording panache, warmth and an element of protection, as standard. A good quality men’s scarf is typically made from wool, cashmere, angora, cotton, linen, silk or a combination of any two. Weave is an important consideration as bulky scarves, made from thick yarns, require simple knots and are not as practical. 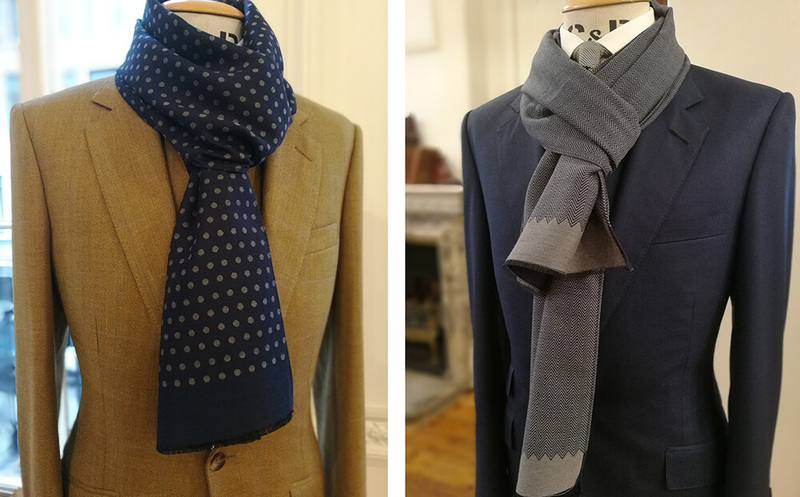 Lightweight scarves are by far the most adaptable – you can’t go wrong with wool or cashmere – making them ideal for all but the hottest months of the year. When it comes to the basics of men’s scarf buying you need to consider size, material, colour and design. For us, the ideal scarf should be somewhere between 16 – 30cm in width and 100 -150cm in length. These dimensions give enough surface area for the scarf to look its best, as well as allowing for a variety of knotting and tying options. To maximise wearability, it’s best to avoid lurid brights and noisy patterns, leaning instead toward soft, subtle palettes of clarets, blues and greys. Layering with country tweed suits, navy blue or charcoal business suits and bespoke overcoats will add an easy element of style and flair. Whatever the season, chosen at the right weight, scarves do an excellent job, adding much needed warmth to the neck on cold winters days as well as the bonus of offering protection from the sun on warmer days. Our collection of lightweight, finely woven wool scarves have been designed with all the seasons in mind, combining a classic palette with stylish yet subtle designs.